September 11, 2001 was a day in my life that was one of the most profound and memorable. I don’t know a single person who doesn’t remember exactly what they were doing on that fateful day. First of all, though, I’d like to remember all those families who lost a loved one in the terrorist attacks on 9/11. Tuesday, September 11, 2001 started out as an ordinary day – the sun was shining brightly and the sky was the most beautiful blue without any clouds. While waiting for the school bus with the kids at the end of our driveway, we watched a kinda crazy small plane that was doing some ‘loop de loops’ in the sky – that had happened a few times before as it appeared like someone was practicing his stunt-flying skills. We watched and chuckled until the school bus came. Chris and I decided to get an early start to pick up some off-cut wood from the roof truss company that was available for free (it made good kindling in our woodstove). As we were driving along the road, the radio music program was interrupted by an important news bulletin : a plane had crashed into the World Trade Centre in New York City about 8:45 a.m. …… and further details would follow. I said to Chris that it was probably another small plane that had lost its bearings in the fog or something – dumb pilot – and hit the world’s tallest building by accident……. Over the years, other planes had hit tall buildings accidentally. We arrived at the Roof Truss place and began to load the 2×4 pieces into the back of the truck for the next half an hour or so. One other large delivery truck was waiting in the company’s laneway and the driver was sitting inside listening intently……….. to the music I thought. When we finished loading the wood, we hopped into the truck and headed for home. Of course, the radio came on right away but there was no music. 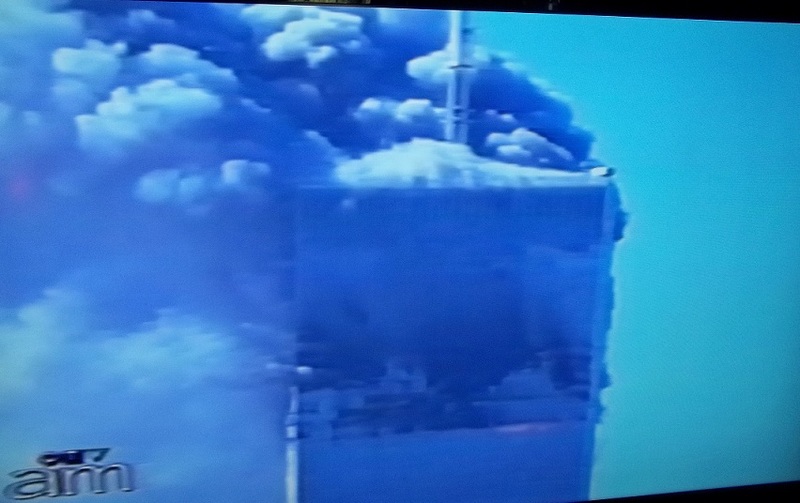 A live report from New York City was being broadcast frantically stating over and over again that a commercial aircraft had just flew into the World Trade Center again! What was going on, I thought. I was really confused at first but then I understood what was going on. We just listened and talked and prayed that all those tens of thousands of people inside could get out. It was a slow shock that I could feel taking over my body. I knew it was terrorists attacking and I said to Chris that I bet it was that Bin Laden fellow – I had read an article in Readers Digest about him and his links to a terrorist group called Al-Qaeda. The World Trade Center had already been a target of a terrorist attack in 1993 when a bomb exploded in the underground parking garage, killing 6 people. 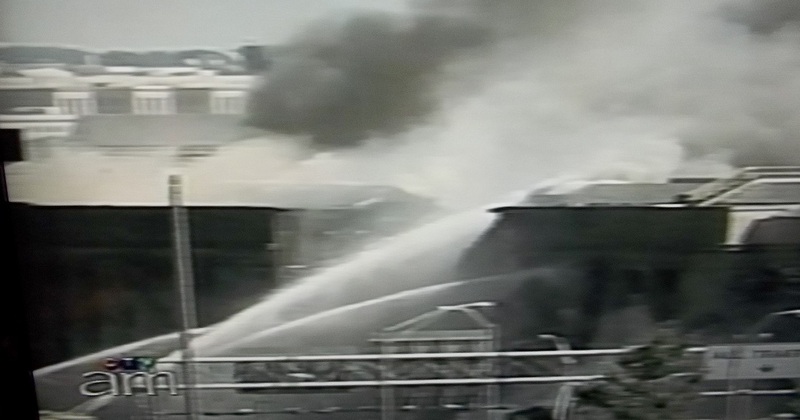 As we were driving through a nearby small town towards home, the radio announcer screamed that an airplane had crashed into the Pentagon in Washington, D.C.. I just couldn’t take it anymore and I buried my face in my hands and just started crying. About 30 seconds later, I abruptly felt alarmed since we lived near Canada’s capital, Ottawa, and maybe WE could be in danger too. Many high target sites throughout the world were closed immediately and evacuated including Parliament Hill in Ottawa. I told Chris to turn around because we were going to the school and pick up our two youngest children right now! and bring them home where they would be safe. After he dropped us off at home, he drove to Marty’s high school and picked him up too. Marty said later that the buzz went around the school that his brother had died in the twin towers – not true. During the most tragic, scary, and threatening day in history, I just wanted my kids safely home. I didn’t know what was happening or why, or what was going to happen next – I was very afraid. When I got home, I immediately turned on the TV and put in a VHS tape to record this news – I wanted a record of these unprecedented tragic events for historical significance (some day). I knew that I (and perhaps generations to follow) might need to see and hear for themselves how this terrible day unfolded, minute by minute. 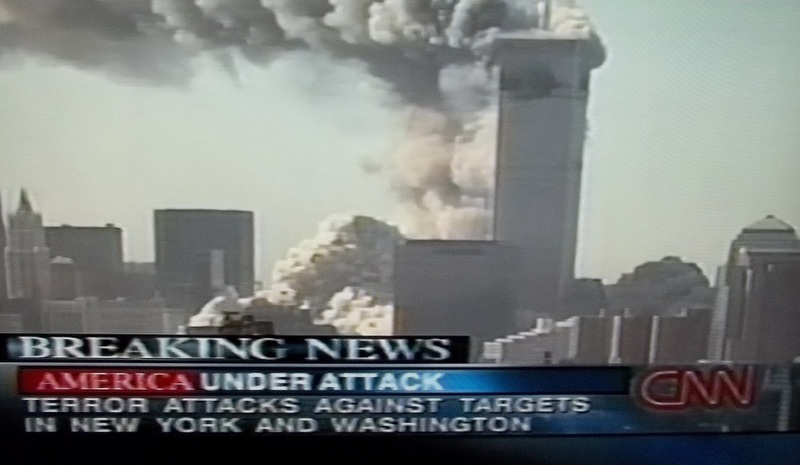 It was actually less than an hour after the first plane hit that the media mentioned that Bin Laden could be responsible. Soon after, I heard that every airplane in North America was instructed to land at the nearest airport and ‘air space’ was now closed to all commercial air traffic – it remained that way for 4 days. There was one scary moment when an unidentified aircraft was ‘headed’ for Vancouver, where my son Taylor lived. I fretted for over an hour, worried sick, until the media reported that it was simply a language misunderstanding problem with a foreign airline and they landed safely. Hundreds of airplanes heading to the United States, landed at Canadian airports – the people on these aircraft spent days in our cities and many of them were welcomed into local homes. I remember that I couldn’t sleep for about two weeks – the pain of the loss of life was so profound for me. The scope of the damage to the psyche was unreal. I was on high alert. Seeing those World Trade Center twin tower buildings (that were just a few hours before, the tallest buildings in the world) …. collapsed in a heap of rubble with smoke rising from them for weeks….unfathomable. That smoke could be seen from the International Space Station. It became known as Ground Zero. People buried in the rubble…….. and emergency workers from all over (including Canada) digging through the massive rubble (which became known as ‘The Pile’), one 5 gallon bucket at a time, all in line passing the full buckets back. Only 20 people were ever rescued alive from the rubble at the World Trade Centres. Most striking that day, were the tens of thousands of people walking away from Ground Zero, down streets, over bridges……… like the walking wounded – they were definitely emotionally wounded. Public transportation in New York city came to a halt and everyone just had to walk home. Everything came to a standstill and buildings evacuated like the United Nations, the New York Stock Exchange, the Empire State Building, and the White House to name a few. Throughout the day, many more images of the tragedy, from different angles, were broadcast for the world to see the horror. I believe that I talked on the telephone to most of my grown children and my two Sisters during the day – I needed to hear their voices and talk it out. I also remember the missing – relatives plastered every surface in Manhattan with photos of their missing loved ones …….. thousands of them…….they were just gone…….vanished. A CNN reporter, Elizabeth Cohen, was reporting from one site and just broke down on camera crying that they were “gone, just all gone”. I was very moved. Only about half of the people missing were ever officially identified. It was a shocking day that became a shocking week that became a shocking month that became a shocking year….. and nothing has been the same since. Airport security has increased to new levels as has U.S. border crossing security. As a society, I think we are somewhat more paranoid, too. It was a ‘wake-up’ call to the developed world especially the United States – an enemy with no country brought them to their knees. I find it ironic, in a way, that the terrorists chose September 11th or 9/11 as the day for their horrific attacks – 911 being the signature call for Emergencies – a fact that I’m sure did not escape them. 3,497 people died in New York City, Washington, and Pennsylvania, including 27 Canadians, on September 11th, 2001. I will NEVER forget. 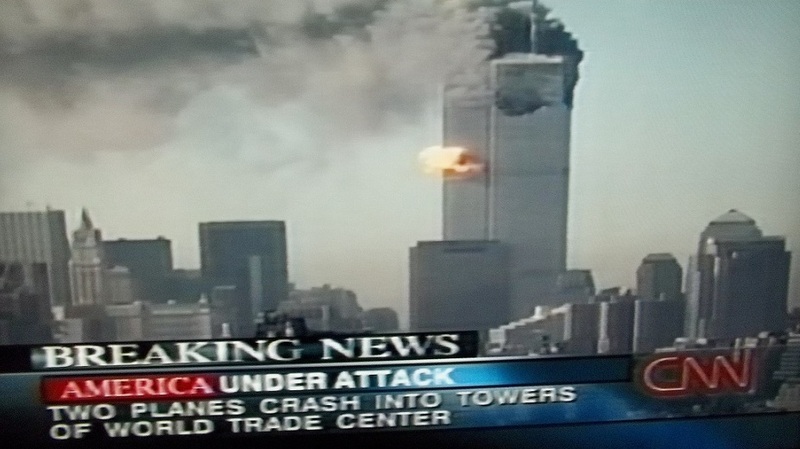 I’m sure you remember what you were doing on September 11, 2001……. 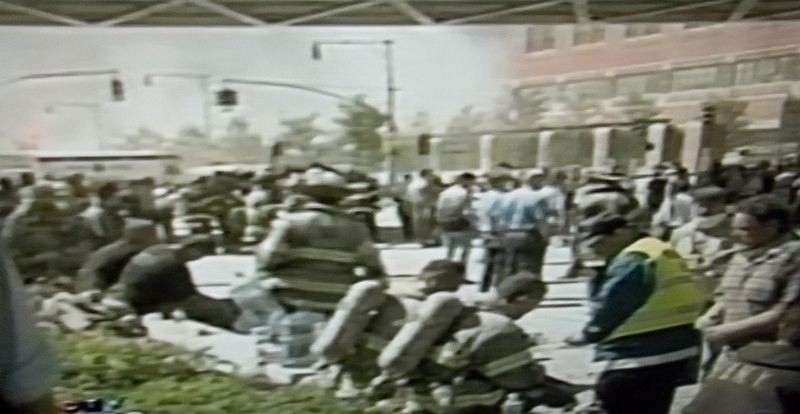 *All the pictures in this post were taken from my Video Recording of the actual events as they happened on 9/11. alas for the imperialist arrogance that provokes this kind of attack, and for those who think such actions can do any “good,” and for the insane imperialist over-reaction to them. I was right where we are today, at Brissons’ in Cochrane, and sent the day surveying mussels and Crayfish south to home..
Nice post, I remember that day, seems like yesterday. A few interesting facts about 9/11. 1. How did four highjacked aircraft fly so wildly off course for such lengthy periods of time without being confronted by a single fighter interceptor? It is standard operating procedure to scramble jet fighters whenever a jetliner goes off course or radio contact with it is lost. Between September 2000 and June 2001, interceptors were scrambled 67 times. In the year 2000 jets were scrambled 129 times. average interception time is under 6 mins. Some of the planes on 9/11 were out of contact for up to 39 mins. 2.George W. Bush’s father was meeting with Osama bin Laden’s brother, Shafig bin Laden, in the Ritz-Carlton Hotel, Washington, on the morning of 9/11. They were on Carlyle Group business just a few miles from where hijackers acting on behalf of Osama bin Laden would fly a plane into the Pentagon. Recall also that the chief financier of the hijackers, Pakistan’s Chief Spy General Mahmoud Ahmad, was meeting with Bush administration officials the week before 9/11. He also met with Bob Graham and Porter Goss on the morning of the attacks, who would later go on to head the first 9/11 investigative committee. If anyone doubt any of this information, look it up, it can be confirmed by many different reliable sources. 9/11 was a terrible event and a proper international investigation should still be carried out(9/11 commission was a joke.). The families of the people who died deserve truth. I dont know what happened day, but history has shown us that the united states government cannot be trusted. Yes there are way too many unanswered questions about 9/11. A Global investigation would be a good place to start…….